I read some positive reviews about AlgExit, so when i chanced upon it at a shop a few weeks ago, i decided to get a bottle to try out. Although i don't have any major algae issues in my tanks at the moment, i do allow a layer of green fuzzy algae to grow on bare hardscape, which i actually consider as part of the aquascape. So i figured it would be interesting to see the treatment's effect on this type of algae (in case i need to manage it in the future). I dosed according to the bottle instructions at 1 ml per 10 liters of tank volume per week. My tank volume is around 64 liters so i dosed slightly less at just 6 ml each time. The active ingredient listed on the bottle is salicylate. There was no change in my routine maintenance, water changes, lights, Co2, fertilizer dosing or feeding regimen... everything was still kept the same. No noticeable issues encountered with the fishes and shrimps during the treatment, so it seems to be safe with most fauna. From the side-by-side comparisons, the treatment worked quite well to gradually reduce this type of algae. At least now i know how to manage it if required. 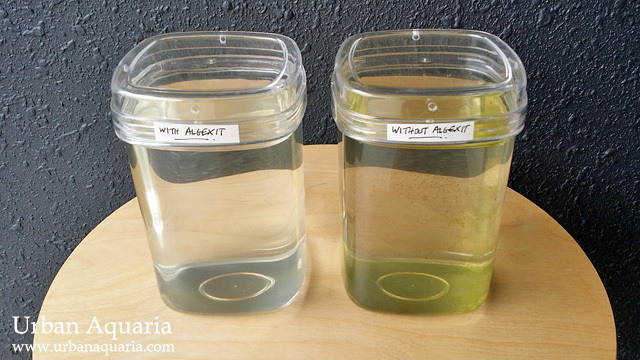 Since i had a fair bit of extra AlgExit solution leftover, i decided to do a follow-up side-by-side comparison test of the effects of this algae treatment to see the difference between tank water samples that have it added versus those that don't have any treatment. 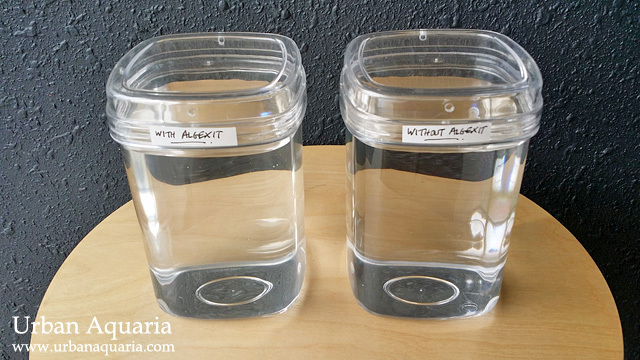 I set up the comparison by using 2 clear plastic containers, one has old tank water with AlgExit added, while the other one also has the same old tank water but no AlgExit added. Both containers are overdosed with Tropica Specialized fertilizers (contains macro + micro nutrients) and are placed outdoors at a balcony area which receives full direct sunlight. 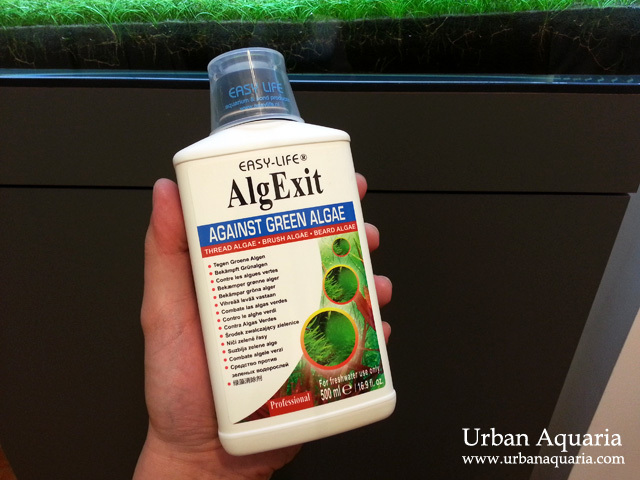 The container with AlgExit added has very little traces of algae... on the otherhand, the container without AlgExit has a visible coating of green algae. Hello! Thanks for doing a review on this product. I've been looking for a product to help manage hair or fuzz algae growing on my HC and yet ensure that it does not kill my fire red shrimps. Where did u buy This from in SG. AND did you just add it to the water column or spray directly to the affected area. I bought it from Polyart at Clementi in Singapore. I just pour the recommended dosage of AlgExit solution into the path of the filter outflow so that it circulates around the tank. It doesn't have an immediate algae melting effect like other chemicals, so no need to spot dose. From my experience, its effect is gradual and functions over a longer of time, as it seems to mainly inhibit the algae growth while your other treatments (ie. Excel, H202, manual removal etc) and livestock clear the existing algae. Thanks for this excellent product review. Is it advisable to dose this regularly even when tank is without visible algae, like add this to dosing regime perhaps weekly after doing water change? Well, aside from the normal dosages for the 4 week treatment period... the instructions on the bottle also recommend a "preventive" dosage of 5ml per 100 liters once every 2 weeks (after the algae is gone), so i guess that can be done as part of a longer term maintenance practice. So far i haven't encountered any issues using AlgExit (at recommended dosages listed on the bottle) in my planted tanks, the plants still grow well. So i guess this treatment seems to be relatively safe for most plants.